We were approached by the client to produce an interactive guided tour for the Prestonpans battlefield site. The purpose of the app was to make the tour more user friendly than paper maps for their visitors and to help them to find their way around unaided. It encompasses information about the Battlefield, the Waggonway and the Tapestry which was created to commemorate the Jacobite uprising in 2010. The app uses a map, with markers highlighting points of interest around the site. The integrated map functionality also reduces the need for printed maps which cuts down on paper waste and printing costs. Users can choose to take pre-set ‘walking tours’ and be presented with information relating to each location as they reach it. The app aims to replace previously used pamphlets and provide a much richer user experience. 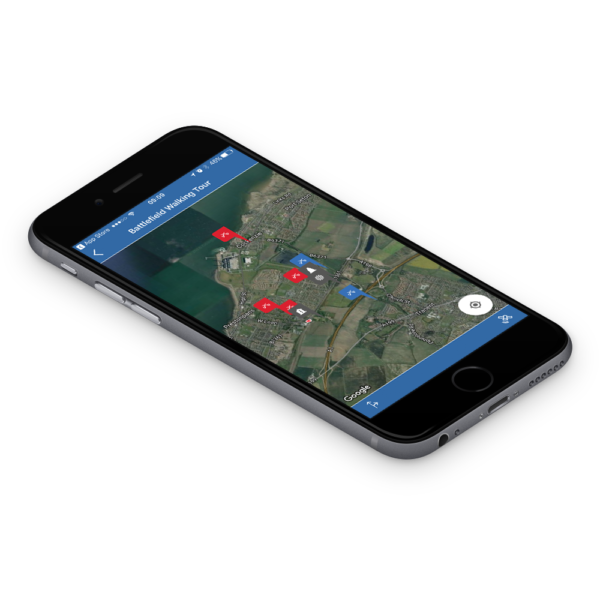 Alerts are also used effectively to ensure that information isn’t missed when key areas of the location are visited. The app contains features such as walking directions and alerts when each site is reached. As well as the interactive tour, it also contains an offline store of tapestries relating to the Battle of Prestonpans 1745. The app was built for both the iOS and Android platform and can be downloaded from the relevant app store. If you’re interested in using maps technology in your next app, contact us to discuss your project.